Just like so many groups, the story of The Innocents began in high school. In their case, it was Sun Valley Junior High School, Los Angeles. This was the first step in a story documented on The Innocents-Classic Innocents-The Reprise, Decca, Warner Bros and A&M Recordings…Plus More, which was recently released by Ace Records. It features twenty-eight tracks, including eleven previously unreleased tracks, plus demos and rarities. As I tell you about The Innocents career, I’ll tell you about the music on The Innocents-Classic Innocents-The Reprise, Decca, Warner Bros and A&M Recordings…Plus More. 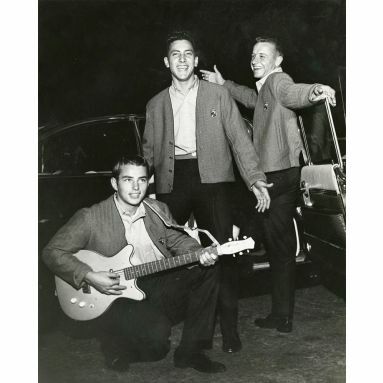 It was 1958 Darron Stankey formed his first band The Emeralds. Darren was a member of a car club called The Innocents. This was really a front for fun and carousing. Drinks were consumed, guitars produced and songs were sung. 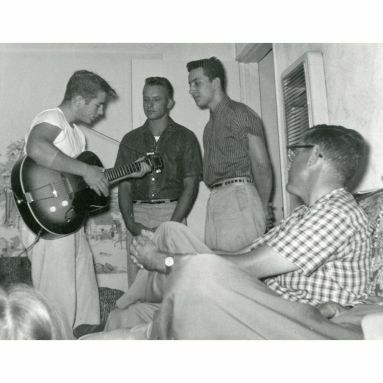 A willing participants to the carousing was Darron, Wayne Edwards, Frank Zworkin and Larry Tamblyn. Realizing they had potential, they formed The Emeralds. It was a short-lived band. Work, college and conscription resulted in the band splitting up. Undeterred, Darren decided to form another band. For Darren’s new band, members were recruited from the car club. Al Candelaria and Larry New joined the band, who were now called The Echoes. Each of the three members were childhood friends. They’d been friends since they first started school. After a while, they decided to invite Jim West along. That was a smart move. Jim was he a talented singer. This was apparent from the first time they heard him sing. Jim’s Echoes debut was in 1959 at an event organized by The Innocents car club. It was literally a show-stopper. People stopped and listened. They were smitten by Jim’s voice. No wonder. He’d been singing since he was a child, and was a natural. The final place in The Echoes jigsaw was in place. Now a quartet, The Echoes were about to encounter a legendary producer. After a concert in 1959, The Echoes were approached by a promoter. A female vocalist was recording a single and needed a backing group. The Echoes fitted the bill. There was only one problem, they wouldn’t get paid. Deciding it was worthwhile for the experience, they headed to the. Their job was to accompany Lorin “Speed” Kopp. Co-producing the session was Herb Albert. He liked The Echoes and offered to help them record a demo and then their debut single. Rehearsals with Herb Albert went on for a while. He was helping The Echoes hone their sound. Then one day, Jimmy Hiliard of Keen Records approached The Echoes about signing to Keen. They agreed and were signed to the Andex Records imprint. Now signed to Andex, The Innocents released Time, which was essentially a cover of The Dells Time Makes You Change. Released in September 1959, Time was credited to Jim West. Unfortunately for The Echoes, at the same time as Time was released, Keen’s biggest signing Sam Cooke, released There I’ve Said It Again. All the label’s efforts went into Sam Cooke’s single. Sadly, Time wasn’t promoted sufficiently, and the single wasn’t a success. For Larry New who was already unsettled, this was the final straw, he left the band. The new lineup was James the first tenor and lead vocalist, Darren was second tenor and Al baritone. This was just the first change for The Echoes. They changed their name to The Innocents, paying homage to their car club. Another change was The Innocents were writing their own songs. They hoped this would lead to Herb Albert mentoring the group. That wasn’t to be. Herb was no longer interested in The Innocents, but Kim Fowley was. Without a label, The Innocents decided to knock on a few doors. Luckily, the chose the right door to knock. It was one with Kim Fowley behind it. He’d enjoyed success with Gary Paxton as Skip and Flip, then as The Hollywood Argyles. Kim decided to give The Innocents a chance. They ran through some of their songs. When they got to Honest I Do, which became The Innocents’ best known song, although it was only partly written, Kim liked what he heard. He called Gary Paxton. When he heard it, Kim, Gary and The Innocents got to work on finishing the song. Once it was finished, a contract was signed and the song signed to a small independent label, Indigo Records. Honest I Do was one of several tracks The Innocents recorded with Kim Fowley and Gary Paxton producing. Tick Tock, Gee Whiz, My Baby and Hully Gullys were all recorded during this session. On the release of Honest I Do, which opens The Innocents-Classic Innocents-The Reprise, Decca, Warner Bros and A&M Recordings…Plus More, it reached number twenty-eight in the US Billboard 100 Charts in 1960. No wonder. A tender, impassioned paean, with an understated arrangement, it was the perfect start to The Innocents career. For The Innocents, their lives were transformed. Suddenly, they were huge stars. There was even an appearance on American Bandstand. While all this was happening, things went sour for producers Kim and Gary. They were replaced by Jim Lee. Unknown to Indigo, Kim and Gary had kept a track from when they produced The Innocents. Maybe this was their insurance, in case they were replaced. This track was Tick Tock. They shopped it too Transworld, who released it was as a single. Tick Tock, plus the extended under-dubbed version feature on The Innocents-Classic Innocents-The Reprise, Decca, Warner Bros and A&M Recordings…Plus More. Indigo weren’t happy. Their response was to release Gee Whiz as a single. It was always meant to be The Innocents sophomore single. It reached number twenty-eight in the US Billboard 100 Charts in 1960. By then, The Innocents had become one of the biggest groups of that time. They even had their own fan-club, which is how The Innocents met Kathy Young. Kathy Young was only fourteen when she met The Innocents. She was a singer and songwriter in waiting. After a chance meeting with Jim Lee, he recommended Indigo audition Kathy. They did. This resulted in Kathy landing a record deal. She then recorded A Thousand Stars, a song which The Innocents were meant to cover. Instead, they sang harmonies. This worked well. The single reached number three in the US Billboard 100 Charts and number six in the US R& Charts. For Kathy Young, this kickstarted her career. Sadly, The Innocents career started to stall. The Innocents then released as a followup Kathy, which was their third single for Indigo. It wasn’t a commercial success. By now, The Innocents were beginning to wonder if Jim Lee was running out of ideas? Considering The Innocents were about to release their debut album Innocently Yours in January 1961, this couldn’t have happened at a worse time. Innocently Yours featured twelve tracks. This included singles Honest I Do, Gee Whiz and Donna, plus tracks like Walking Along and Hog For You. The album sold well. Things it seemed, were looking well for The innocents? Then later in 1961, Jim Lee left Indigo. The owners seemed to lose confidence in him and he was sidelined. Later in 1961, The Innocents received their first royalty cheque. Rather than being owed money, they owed Indigo money. Cars, clothes, plane tickets and numerous other things, The Innocents were charged for it. This was all down to The Innocents not knowing how the music industry worked. They were neither the first, nor will they be the last to be caught this way. Suddenly, The Innocents, weren’t so innocent. They’d learnt the hard way. For a while, The innocents considered leaving Indigo. There was even talk of Capitol taking over Indigo just to sign The Innocents and Kathy Young. The owners scared they were selling themselves short, decided that Capitol might pay more. They wouldn’t. Their bid was turned down and Capitol walked away. Then things were about to get worse for The Innocents. October 1961 saw The Innocents release what was meant to be their final single for Indigo, Pains In My Heart. They’d given notice of their intention to leave Indigo. Eight months later, Indigo Records was no more. One of their final releases was a rerelease of The Innocents’ Time. By then, The Innocents were still trying to find the right deal. It took a year before without a record deal before The Innocents found the label that they felt suited them. This was Reprise Records, who were a new label. They were founded in 1961, so had no experience in the pop market that The Innocents operated in. Reprise sent them into the recording studio. Over two separate recording sessions, The Innocents recorded six songs. 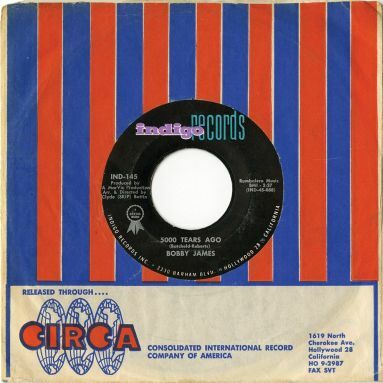 Oh How I Miss My Baby was released as a single in October 1962. Two different versions of the single were released. The first version features Be Mine as the B-side, while the second version features You’re Never Satisfied. These three tracks, plus unreleased tracks like Pledging My Love, Lovely Way To Spend An Evening and (If You Cry) True Love, True Love demonstrate how The Innocents had matured. They’d honed their sound. Their trademark harmonies were tighter, heartfelt and filled with emotion. Sadly, The Innocents time at Reprise wasn’t successful. When Nick Venet who signed them left Reprise, his replacement wanted The Innocents to become a country group. That wasn’t going to happen. So, The Innocents saddled up and left Reprise. Ironically, after spurning Jimmy Bowen’s offer of becoming a country group, it was a former Nashville DJ that got The Innocents signed to Decca. Even better, Shane Wilder loved their music. He was the perfect man to try to rejuvenate their career. Shane fired The Innocents up. He got them writing some new songs. They headed into Radio Recorders with some of Los Angeles’ best session musicians. 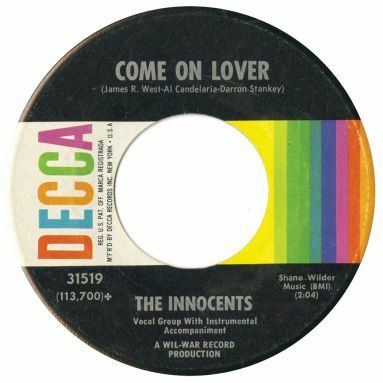 Come On Lover and Don’t Cry were released as singles and feature on The Innocents-Classic Innocents-The Reprise, Decca, Warner Bros and A&M Recordings…Plus More. Unfortunately, neither Come On Lover nor Don’t Cry replicated the success of their earlier singles. That these singles weren’t a success is a missed opportunity. Here, The Innocents’ talent shines through. Soulful, emotive, pleading and full of hurt, describes their vocals on the two songs. Following the failure of the two singles, The Innocents left Decca. For them, it was the end of the road at Decca. Little did the realize that after this, it literally was the end of the road for The Innocents. Having left Decca, The Innocents were signed to Warner Bros, where they worked with Jim Lee and Lee Hazlewood. This was their fourth label in as many years. Still, there was no sign of The Innocents recapturing the form of their time at Indigo. With every year that went by, their career slid away. In the pop world, stars grew old quickly. There was always someone coming along to replace the “aging star.” Careers lasted only a few years. The Innocents had done well. They’d been together five years, since 1959. The window of opportunity for The innocents was about to slam shut. Considering this was make or break for The Innocents, you’d have expected them all to be ready to record. Wrong. Darron wasn’t in the studio when My Heart Stood Still was recorded. He was there when Don’t Call Me Anymore was recorded. With the two tracks laid down, Lee and Jim were men with a vision. The Innocents were going to be “sold’ to an audience to like Lettermen. That seemed a good idea. The first part in this plan was releasing My Heart Stood Still as a single. That’s where things went wrong. A few weeks earlier, somewhat belatedly, America “got” The Beatles. Cue the British invasion. Now groups like The Innocents were yesterday’s news. Unwilling to throw in the towel, Lee and Jim decided The Innocents should record My Heart Stood Still. That was all that was salvageable from the recording session. The end it seemed, was neigh for The Innocents. It certainly was for Lee Hazelwood and Jim Lee. Lee decided to take an extended break. He thought the influx of British acts wouldn’t last. It did. Jim Lee decided to call time on his label. As for The Innocents, they too decided to call time on their five year career. That wasn’t the last the music industry heard of Darron and Al. No. They decided to form another group, The Sugar Beats in 1966. The Sugar Beats had the chance to record for Herb Albert’s A&M Records. Looking for a third member, Jim Lee was approached. He was busy writing songs. Instead, they turned to their old car club and recruited Ken Mowery. Ken became the third Sugar Beat. Signed to A&M two singles were released, First Love and Begin, Give In. Both singles feature on The Innocents-Classic Innocents-The Reprise, Decca, Warner Bros and A&M Recordings…Plus More. These two tracks show the difference two years made to the former Innocents. Music had changed. Their music had changed and matured. Of the two tracks, the wistful First Love is a real hidden gem of a track. It’s lain unloved for too long. A quite beautiful track, the only problem was it wasn’t fashionable. Sadly, neither of The Sugar Beats singles proved to be a commercial success. Far from it. Psychedelia was about to be born. Groups like The Sugar Beats were behind the musical curve. Regardless of the quality, The Sugar Beats weren’t perceived as innovative and progressive. It seemed that yet again, Darron and Al were subject to the vagaries of musical fashions. That proved to be the end of Darron and Al’s involvement with music. They’d been enjoyed a six year musical journey as The Innocents, then a brief comeback as The Sugar Beats. All this is documented on Ace Records’ recent compilation The Innocents-Classic Innocents-The Reprise, Decca, Warner Bros and A&M Recordings…Plus More. It’s the most comprehensive compilation of The Innocents music. There’s music from every period of their carer. This includes their biggest hit single Honest I Do. Whether it’s from The Innocents time at Indigo, Reprise, Decaa or Warner Bros, there music from that period. There’s even two versions of Tick Tock, which were released on Trans-World. That’s no forgetting eleven previously unreleased tracks, plus demos and rarities. Among them are two cuts from The Sugar Beats and three songs by Jim West. In total, there are twenty-eight tracks on The Innocents-Classic Innocents-The Reprise, Decca, Warner Bros and A&M Recordings…Plus More. There’s only a couple of omission and they can be excused. There could’ve been more songs from The Innocents time at Indigo Records. After all, that was their heyday. Having said that, it was good to hear such an eclectic selection of The Innocents music. It would’ve been good to hear The Innocents collaboration with Kathy Young, A Thousand Stars. Maybe this wasn’t possible, given ownership problems? 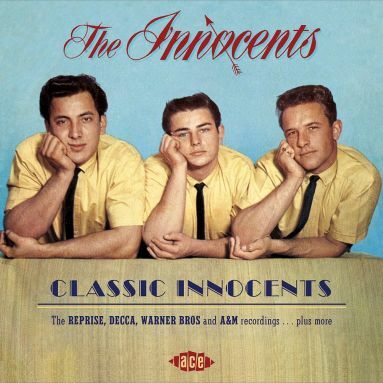 That there are a few omissions doesn’t detract from the quality of The Innocents-Classic Innocents-The Reprise, Decca, Warner Bros and A&M Recordings…Plus More. Far from it. This lovingly compiled compilation, The Innocents-Classic Innocents-The Reprise, Decca, Warner Bros and A&M Recordings…Plus More is best described as everything you want to know about The Innocents but were afraid to ask. Standout Tracks: Honest I Do, First Love, Tick Tock and Be Mine.